App for Messenger™ (Facebook™ Messenger) is the easiest way to open and use Messenger from your desktop machine (PC, MAC or Linux). 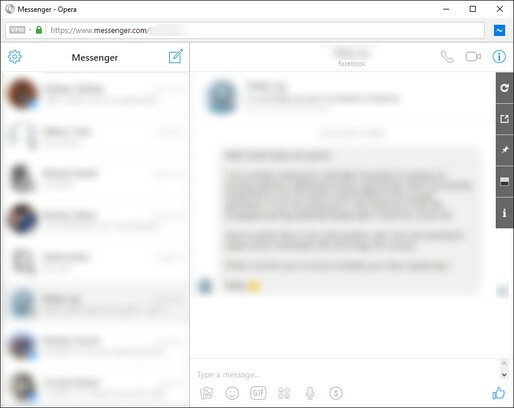 Clicking on the toolbar button, renders Messenger in a standalone UI. Moreover, the window is re-sizable to your desired choice and all the changes are auto saved to the memory. Note, to start using this App, you need to have a Facebook account. App for Messenger™ is designed to operate similar to Google Chrome Apps. In other words, it opens in a simple and stand-alone popup window (as opposed to the toolbar-popup or sidebar), and once closed, completely clears-off and won't have any further background activities. Having this behavior, it is considered a very lite Addon and does not add any additional burden to your Opera browser. Moreover, the popup has a built-in "Always-On-Top" feature which makes the window remain always on top of other windows, and enables you to do multi-tasking. Important Note: App for Messenger™ does NOT belong or related to the official Facebook/Messenger website or application in any ways. It is an unofficial app that is developed and maintained independently. The official Messenger software is only released for smart phones and the web. This unofficial app (browser addon) is a wrapper to the original Messenger application and tries to make it usable as a browser plug-in.